If I don’t have any media interviews coming up, do I need media training? How do I find a good media trainer? How many people can we have in a group session? How do you structure your training programs? Media training is intended to prepare you for interviews with members of the media. The point of the training is to provide you with an understanding of the media interview process, refine your messaging, and polish your delivery. Great media training and presentation training incorporates three key elements: solid business strategy, thorough knowledge of the media, and a deep understanding of human behavior. A media trainer whose only knowledge is of the media, versus a media trainer that also possesses a solid background that includes business strategy, is what makes the difference between a client’s media interview that goes relatively well, and one that makes a real and significant impact on your brand positioning and your bottom line. 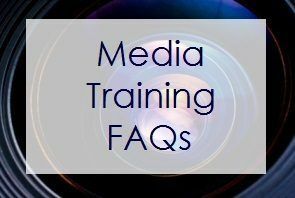 Generally, media training includes some education on what members of the media want, various interview formats, how to work with the camera, how to craft concise and thoughtful messaging and responses to questions, and how to convey charisma and energy in interviews. Most media training is “on-camera” training, which means that there will be a video camera pointed at you. If this makes you nervous, practicing interacting with the camera through media training will help you to become less nervous in future on-camera situations, be they media interviews, promotional videos or online presentations. Media trainers can prepare you for specific types of media interviews or for a wide variety of interview formats. Your media training sessions should be tailored to your needs. Whether you are preparing for print interviews, radio interviews or TV interviews, good media training should enable you to provide clear and concise responses, and to confidently present your position in a manner that reflects your brand. Anyone who could possibly be interviewed by the media should receive media training to protect the individual’s and the organization’s reputation and brand. Members of the media prefer to work with people who are prepared, and good media training is the best way to ensure this. Media training is important for corporate spokespeople, actors, music artists, athletes, executives, entrepreneurs, experts and other public figures. Why do I need media training? Can’t I just read a book and get all the information I need? No. The act of preparing for media interviews is intellectual, emotional and physical. To borrow and butcher a Thelonious Monk quote: talking about media training is like dancing about architecture. You have to experience it. Getting feedback in the moment and then making adjustments on the spot will help to create new patterns in your brain and enhance “muscle memory” with anything related to your body language: body language makes up approximately 93% of our communication. Media interviews are unlike any other conversation you will have in life. Even great public speakers and people who are comfortable in most situations need media training to understand how to handle various interview situations and formats and to avoid falling into the traps that can trip up someone who is unprepared. If you plan on using any media, including social media, to communicate with the public then media training can help you gain greater clarity and command of your message and it will help you avoid some of the costly and image-breaking mistakes that can be made without proper strategy and preparation. You don’t want to wait until you have the pressure of an interview to begin preparing. What do I need to know about the media? There is a lot to know about the media, and here are some links to get you started. To familiarize yourself with some of the terminology you will hear in media interviews, click here. Read our blog for many more tips. Do your research. Look at the experience of the trainer to ensure that he or she has a mix of business experience and media training experience. Read testimonials from other people who have received media training from this individual. If you are considering receiving training from a larger firm, be sure you learn about the experience of the individual who will be providing the training. Don’t assume that just because someone is good on camera that he or she will know how to train you. Just as some people are great actors, but not great acting coaches, the same is true with media trainers. Look for someone with a track record as a media trainer. Be sure that the media trainer has many years of experience working with a variety of media outlets. A deep understanding of the needs and the respective preferences of the media is necessary to be a good media trainer. Visiting this site is a good place to start. Check out our services page. For the informational portion of the media training session, we can accommodate any number of attendees. For the practice interviews, we can accommodate up to 10 people in a two-day session. However, several factors influence the number of people we recommend having in a media training session, including the complexity of the information the training participants will deliver, the experience level of each of the participants, and whether or not there are other situations for which the trainees must be prepared such as presentations, panels and trade shows. To discuss your group’s specific needs, call us at 310-479-0217. Fees for media training services can vary from firm to firm and client to client. Generally, fees begin around $1,500 and can go up to $20,000 or more depending on the number of people being trained, time involved and complexity of the material. It’s important to know what you are paying for. Some of the primary factors that influence fees for media training are listed here. If you have further questions, feel free to contact us. As with almost any service, you pay more for expertise and experience because it’s worth it. If you’re taking advice and receiving coaching, you want to make sure the people providing it have deep knowledge in their field and some strong testimonials. You can be trained to look and sound good in an interview that looks and sounds good, but there’s much more to making the most of every press opportunity. Experience in front of the camera does not necessarily mean that a trainer understands what it takes to grow a business or position clients to attract the deals they desire. To be a good media trainer, one must have experience positioning clients for growth in their field or to achieve goals that far exceed simply doing well in interviews. The depth of media training that you desire for yourself or anyone for whom you are representing may depend on the complexity of the content you deliver, the types of interviews for which you want to prepare, and your past experience. We generally hold a complimentary call to ask you questions to find out what will work best for you or the people who will receive media training. Then, we create a customized program to suit you. It’s good to be very realistic about how much time you want to devote to your media training program. We aim to create programs that make the best use of each individual’s time. This is one of the many reasons we customize our programs. If each person who is being trained will need individual attention and on-camera time, the number of people being trained influences the amount of time needed for the sessions, which influences pricing. If extensive travel is required, there can be some travel-related expenses. Many of our clients enjoy coming to our office in the Brentwood area of Los Angeles for their training, but we travel and serve clients worldwide. You don’t want to be left out in the cold after your training session. After media training sessions, it can be beneficial to hold a quick refresher call with your trainer just before an interview. We include these refresher calls as a complimentary service to our clients. When hiring anyone for a service that’s as subjective as media training, you should be able to get on the phone for a complimentary call to get your questions answered. We feel that that first call is important because it helps us to get a sense of you, in addition to giving us the opportunity to ask the questions we need answered in order to provide you with pricing on your media training program. We make sure that our rates are competitive and that our clients receive great value from our media training and presentation training. Request a quote or information. At the start of any client relationship, we learn about the client’s goals and needs and conduct research to prepare for the training session. We customize our programs for each client because each client’s needs are very specific. For example, some clients want us to focus more heavily on educating their teams on working with the media, others want a lot of help with strategic messaging, and some others want a blend of education, messaging, preparation for media interviews, presentations and panels. Call us to arrange your presentation training or media training in Los Angeles, or elsewhere: 310-479-0217.